WINDISCH J, RÖSER D, MOLA-YUDEGO B, SIKANEN L, ASIKAINEN A. 2013. Business process mapping and discrete-event simulation of two forest biomass supply chains. 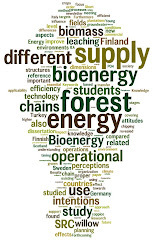 Biomass and Bioenergy. In Press. Previous research in forest biomass procurement has been focussing on reducing harvesting costs. However, organisation and management of supply chains as well are considerable cost factors. The present study applies a methodological framework to investigate two forest biomass supply chains in different operational environments of two European countries (Finland and Germany) in order to identify the business processes and stakeholders making up the supply chains using a business process mapping methodology. Additionally, the work time expenditure for organisational and managerial tasks for each of the supply chains is estimated using discrete-event simulations. The business process mapping revealed that the number of processes in the supply chains varies considerably involving 213 project objects (activities, information items, others) in the Finnish supply chain and 268 in Germany. The work time expenditure on managerial and organisational tasks assessed by discrete-event simulation was 1483 min/100 m3 in the Finnish and 1381 min/100 m3 in the German supply chain. Even though the results of the study are company specific and cannot be directly generalized, as each supply chain reflects the characteristics of its operational environment, the proposed methodology has shown its potential for the in-depth analysis of supply chains in forest business and it is a step towards holistic cost calculation and business process improvement approaches on supply chain level.